The laws protecting the brewing of Kolsch are as strict as Germany's Purity Law of 1516. Kolsch Beer can only be brewed within the city of Cologne. As the best-known Kolsch Brewery, Gaffel's flavor is derived from an ale yeast that is "lagered" or aged in cold cellars. Gaffel is pale and faintly fruity with a crisp hop finish. The city of Cologne or Koln is located on the Rhine River and north of Munich. In Koln, Germany's third largest city, Kolsch beer is nearly the only beer people drink. Gaffel Kolsch is the favorite of Koln. What makes Gaffel Kolsch so special? Like Champagne is to France, authentic Kolsch beer can only come from Koln. No other beer in the world has the taste of an ale and a lager. 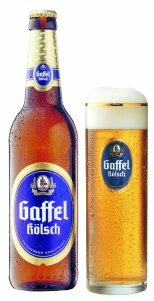 Gaffel Kolsch is light and refreshing but not with an intense hop finish Gaffel is distinctive and elegant; served in the traditional Kolsch glass. Gaffel's light and refreshing taste compliments almost all foods. Gaffel Kolsch is perfect for special gatherings. It is superbly drinkable and subtle without being too filling.